A new gallery exhibit every other month with an opening reception and gallery talk at Lincoln Art Center in Lincoln, Kansas. We welcome new exhibit ideas from all kinds of artists including but certainly not limited to painting, photography, fiber art, ceramics, sculpture, installations and woodworking. Grab an application to see about getting your artwork in our gallery. One of our best attractions is our gift gallery that features the work of artists and craftsmen from throughout the Midwest. You will find hundreds of hand-made, one-of-a-kind items for sale at modest prices. By choosing your gifts from the Lincoln Art Center, you support the arts in the community and delight your special friends and relatives with creative, lovely and unique works of art. 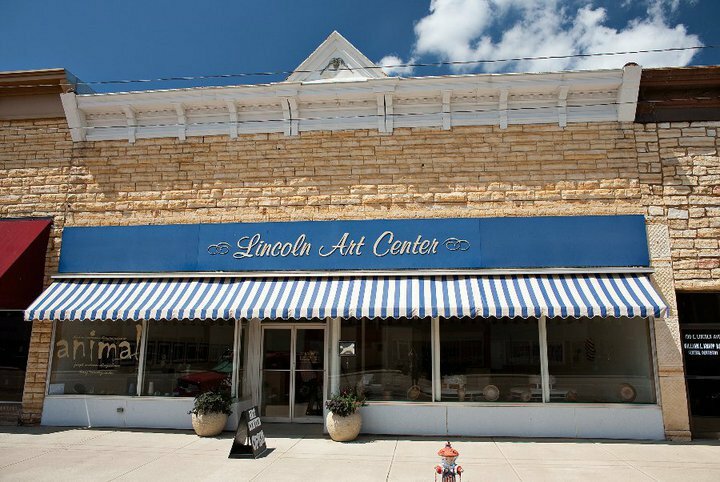 The Lincoln Art Center is active in our rural community and regional area bringing various arts opportunities to all ages. We host weekly studio nights, art classes for beginners, and a summer art camp for our area youth. We are always planning new creative fundraising events, and anyone who wants to get involved in the arts in Lincoln is welcome to volunteer! Please make plans to stop at the Lincoln Art Center soon or attend one of our opening receptions or fundraisers. Everyone is welcome, it’s free to stop in and say hi and look around. NOTE: We are still in the process of porting all the stories from the old website about past exhibits into the new website, all the history, images and information about the artists is not lost and will be available again soon! An updated calendar is in the works also!